While Israel gears up for the return of Gilad Shalit after over five years in Hamas captivity, residents of Gaza and the West Bank are also preparing to celebrate the return of hundreds of Palestinian prisoners slated to be released Tuesday. However, some families will not join the festivities, after learning that their relatives were not included in the prisoner exchange deal and will remain in Israeli prisons. The disappointed families plan to hold a demonstration Monday in protest of their sons' exclusion from the prisoner swap. 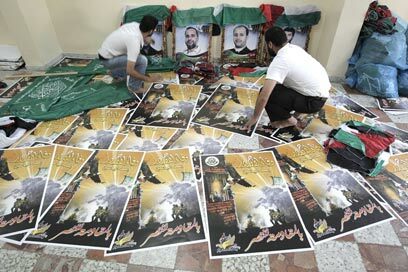 One such family is the Abu Hamids from Ramallah, who have already become a symbol on the Palestinian street. The family's three sons were sentenced to long prison terms in Israel – Nasser Abu Hamid is considered one of the founders of Fatah's military wing, al-Aqsa Martyrs' Brigades and was the right-hand man of Marwan Barghouti; Nasr Abu Hamid, was involved in terrorist attacks that killed Israeli citizens, and Sharif Abu Hamid, who was an activists in the al-Aqsa Martyrs' Brigades. Another brother, Abed al Munam, was a member of Hamas' military wing and killed during an exchange of fire with IDF forces. None of the three brothers were included in the prisoner swap deal. "Both Hamas and Israel are lying to the public – this is a political deal," Naji Abu Hamid, the prisoners' brother, told Ynet. "The timing is not coincidental, and things will become clearer in the future," he said, adding that he believes Hamas and Israel will negotiate to alleviate the Israeli blockade on the Gaza Strip and issue immunities to wanted Hamas members. "There is an Israeli interest to strengthen Hamas on the expense of Fatah in wake of the Palestinian Authority's statehood bid in September, and in my opinion there's going to be a direct interaction between Israel and Hamas. The parties can reach a lull or peace agreement between them," he noted. Naji slammed the Hamas movement, saying that it should not make peace with Israel on the expense of prisoners, which is a highly sensitive matter among Palestinians. He also expressed anger over Israel's conduct, saying "your rightist governments always leaned toward strengthening Hamas. "This is what Ariel Sharon did when he unilaterally withdrew from the Gaza Strip without an agreement with Fatah, and now (Palestinian President Mahmoud) Abbas' policy is shoving Israel into the corner of the international arena, and that's why Israel is pursuing a new agenda," he said. The mother of the family, Latifa Abu Hamid, was honored last month when she was selected to present the Palestinian statehood request at the United Nations. According to Palestinian officials, Abu Hamid was selected because "she best represents the narrative of the Palestinian people." 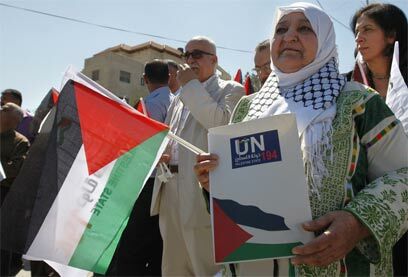 In a ceremony held at the United Nations Relief and Works Agency (UNRWA) headquarters in Ramallah, Abu Hamid, 70, said the most important thing for her after Palestinian statehood is to see Palestinian prisoners held in Israel recognized as POWs. While Naji expressed frustration with the Hamas, he also said that he is mostly angry at his mother, who is one of Hamas' staunch supporters, and over the death of his brother, who was killed while serving as an active member of the group's military wing. "People like (Hamas politburo chief) Khaled Mashaal are riding on the backs of people like my mother and my brother, who is in the cemetery," he insisted. Naji said his brothers were informed that they will not be released as part of the prisoners swap, but noted that their morals were not down because they have spent a long time in jail, and are already used to it. 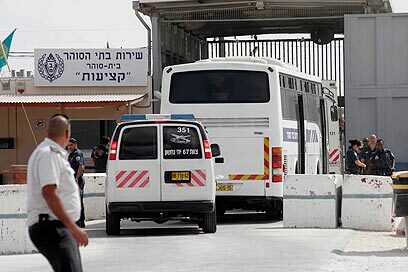 Meanwhile, the website of Hamas' TV channel al-Aqsa reported Sunday that the Islamic group, along with other Palestinian factions in Gaza were preparing for the return of Palestinian prisoners to the Strip. According to the report, the Hamas government set up three central committees that will orchestrate the "large national celebration." One committee, headed by Hamas' Minister of Prisoner Affairs Attallah Abu al-Sabah will supervise the events, while a second committee will be tasked with organizing the official reception in the Rafah Crossing, which will be attended by only 200 distinguished guests, including Hamas ministers, members of the legislative committee, faction leaders and other officials. The website also reported that the prisoners will be transported from Rafah to Gaza in eight buses, which will make their way in a procession towards a central square, while the crowds will cheer them on from the sidelines. See all talkbacks "Palestinian symbol's sons to stay in prison"